Home » NIDA TV » Why Do People Lose Control Over Their Cocaine Use? This animation addresses the question: Why do people lose control over their cocaine use? Researchers monitored the activity of two types of neurons in mice: “urge” neurons, which promote feelings of reward and repeating behaviors that have produced rewards, and “control” neurons, which dampen those feelings and inhibit behavior. Cocaine shifted the balance of activity strongly to the “urge” neurons. When mice received the drug for the first time, the balance quickly returned to normal; but when they received the drug after already having had it many times, the “urge” neurons continued to predominate for much longer. The researchers suggest that the same dynamic occurs when people use cocaine repeatedly, so that early episodic drug use evolves over time into a perpetual strong urge to seek the drug. Why do people lose control over their cocaine use? A recent experiment suggests an answer. Researchers studied cocaine’s effect on two types of neurons in the mouse brain. One type is technically called dopamine-receptor type 1 neurons, but in this animation, we’ll call these urge neurons. The other is technically dopamine-receptor type 2 neurons, but we’ll call these control neurons. 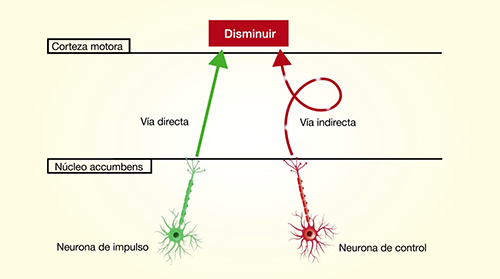 Urge and control neurons are both situated in the brain’s nucleus accumbens. However, they participate in different brain pathways, and have opposite effects when activated. The urge neurons promote feelings of reward and behaviors aimed at repeating rewarding experiences. The control neurons dampen reward and inhibit behaviors that are associated with negative experiences. Normally, the two types of neurons work together to promote healthy behavioral choices. In the experiment, when researchers gave cocaine to mice, the animals’ urge neurons increased their activity, and their control neurons decreased their activity. The balance of activity shifted sharply in favor of the urge neurons. When the researchers gave cocaine to mice for the first time, this imbalance was short-lived. After 25 minutes, the activity of their urge neurons had leveled off and the urge/control ratio returned to its pre-cocaine level. In contrast, when the researchers gave a new dose of cocaine to mice that already had many doses, the imbalance persisted much longer. The activity level of the urge neurons continued to rise and predominate over the control neurons for the entire 30-minute observation period. The researchers believe that this same dynamic occurs in the human brain. Because of it, the person who takes cocaine experiences a compelling urge to take more of the drug with diminished ability to control the urge. At first this condition lasts only briefly, but after long-term use it becomes sustained. As a result, early cocaine use evolves into uncontrolled use and addiction.